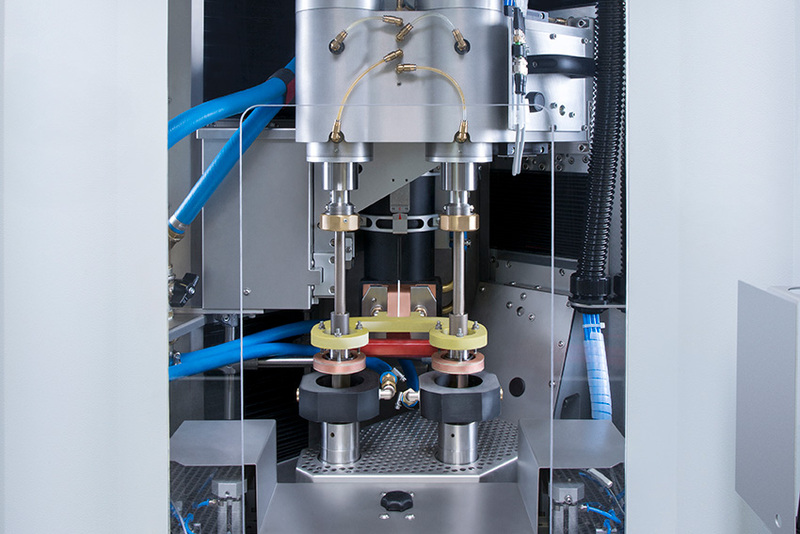 Combined with innovative drive and clamping solutions, the MIND-M plus by eldec provides its users with huge increases in productivity for induction hardening, leading to a decrease in overall unit costs. The powerful generator inside plays an extremely important role. Increased precision, high speed, perfect integration into the production line—these are the major benefits of induction hardening compared to case hardening. (See here for more details.) The process is completed within seconds, with minimal expansion of the workpiece. Additional benefits include the high process stability and low overall machine power consumption. Five years ago, the induction specialist at eldec introduced the MIND-M series, elevating this technology to a new level. These compact machines have a particularly small footprint—without compromising the technology. Costs of investment are also kept low. eldec is now taking the next step: The new MIND-M plus induction hardening machine includes more powerful generators then the traditional MIND-M. Their power ranges up to 150 kW (high-frequency range) or 300 kW (medium-frequency range). Models are also being offered for the first time with dual-frequency generators (DFG) and simultaneous dual-frequency generators (SDF). By combining this new power with the innovative drive and clamping solutions, users benefit from enormous increases in productivity. For example: eldec engineers have developed an indexing table with two workpiece adapters. While one side of the table is being loaded or unloaded by a robot, the hardening process is running on the other side of the table. If the machine includes a dual spindle, then two indexing tables can be used. As a result, two parts can be processed or loaded simultaneously – allowing non-productive times to be greatly reduced and output quantities increased. The multiple clamping column works in much the same way. It has six clamping fixtures on two opposing sides. During the production process, a robot can insert six workpieces on one side, while another six are hardened and quenched on the other side at the same time. It is important to note, that the above process and similar approaches often require that the MIND-M plus be used (especially for larger components) because the parallel processing generally demands an increase in generator power. This allows the efficient MIND-M technology to be used for a significantly wider range of applications. How is customization changing car production? What motor technology is used in electric cars?